A researcher at the University of Southampton in collaboration with an artist at the University of Bradford have developed a brand new educational resource for raising awareness about the 820,000 people in the UK currently living with dementia, including those under the age of 65. The No Limits| Re-imagining Life with Dementia © Educational Resource aims to challenge misperceptions about people with dementia and to start conversations about the strengths and hopes of men and women with this condition. The Educational Resource is the culmination of a pioneering two-year research study by University of Southampton senior lecturer, Dr Ruth Bartlett, on the rise of campaigning and ‘activism’ amongst British people with dementia. 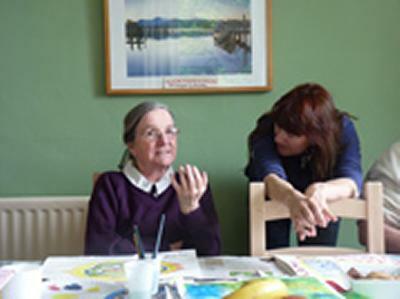 Funded by the Economic and Social Research Council and developed in collaboration with people with dementia, the Educational Resource, which includes a short documentary film and set of postcards depicting ‘protest placards’, is for any individual or group with an interest in dementia or whose role it is to educate others about people with dementia. The Resource covers a range of topics from active citizenship, seeing dementia as a journey, to end of life and advance planning. A further resource for schools is also being developed to help teachers educate the younger generation about the issues faced by those living with dementia.